The battle for digital democracy, the last frontier of press freedom crucial to preserve, continues on a day that will live infamy. The 1996 Congressional Review Act (CRA) empowers Congress to review new regulations issued by federal agencies – enabling a House and Senate majority to rescind them. If repealed, regulations can’t be reinstated in substantially the same form “unless the reissued or new rule is specifically authorized by a law enacted after the date of the joint resolution disapproving the original rule” – 5 US Code § 801(b)(2). In mid-May, Senate members voted to overturn the FCC’s ruling by a narrow 52 – 47 majority. The battle of the House remains waged. Polls show overwhelming public support for Net Neutrality, opposing the FCC repeal. On June 11, intense campaigning to win majority House support begins. A web controlled by predatory telecom and cable giants will transform digital freedom into online tyranny – an objective crucial to prevent. 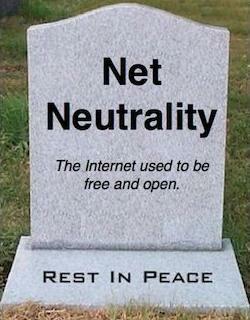 “Net neutrality ends June 11th, but the fight has just begun” to save it. Decades later, millions nationwide like him are needed in real life – giving vent, demanding long denied fundamental democratic rights, accepting nothing less.